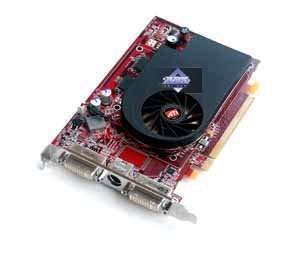 This GPU is presented by the reference ATI RADEON X1650 PRO 256MB (590/1380 MHz) (former X1600 XT), PCI-E. Peak fill rate in the multitexturing mode is 7080 megapixels/sec and 2360 megatexels/sec. By the end of the month the product costs $90-100, supports DirectX 9.0, including Shaders 3.0. A Lower Middle-End card. PCI-E x16. 256MB GDDR3 SDRAM in 8 Samsung chips. On October 15, 2007 the latest drivers from ATI were CATALYST 7.10 for Windows XP/Vista.